“This new concept is, potentially, as drastic an enlargement of our cosmic perspective as the shift from pre-Copernican ideas to the realization that the Earth is orbiting a typical star on the edge of the Milky Way.” Sir Martin Rees, physicist, Cambridge University, Astronomer Royal of Great Britain. Is our universe merely a part of an enormous universe containing diverse regions each with the right amount of the dark energy and each larger than the observed universe, according to Raphael Bousso, Professor of Theoretical Physics, U of California/Berkeley and Leonard Susskind, Felix Bloch Professor of Physics, Stanford University. The two theorize that information can leak from our causal patch into others, allowing our part of the universe to “decohere” into one state or another, resulting in the universe that we observe. The many worlds interpretation of quantum mechanics is the idea that all possible alternate histories of the universe actually exist. At every point in time, the universe splits into a multitude of existences in which every possible outcome of each quantum process actually happens.The reason many physicists love the many worlds idea is that it explains away all the strange paradoxes of quantum mechanics. Putting the many world interpretation aside for a moment, another strange idea in modern physics is the idea that our universe was born along with a large, possibly infinite, number of other universes. So our cosmos is just one tiny corner of a much larger multiverse. Susskind and Bousso have put forward the idea that the multiverse and the many worlds interpretation of quantum mechanics are formally equivalent, but if both quantum mechanics and the multiverse take special forms. Let’s take quantum mechanics first. Susskind and Bousso propose that it is possible to verify the predictions of quantum mechanics. In theory, it could be done if an observer could perform an infinite number of experiments and observe the outcome of them all, which is known as the supersymmetric multiverse with vanishing cosmological constant. If the universe takes this form, then it is possible to carry out an infinite number of experiments within the causal horizon of each other. At each instant in time, an infinite (or very large) number of experiments take place within the causal horizon of each other. As observers, we are capable of seeing the outcome of any of these experiments but we actually follow only one. Bousso and Susskind argue that since the many worlds interpretation is possible only in their supersymmetric multiverse, they must be equivalent. “We argue that the global multiverse is a representation of the many-worlds in a single geometry,” they say, calling this new idea the multiverse interpretation of quantum mechanics. But we have now entered the realm of what mathematical physicist Peter Woit of Columbia calls “Not Even Wrong, because the theory lacks is a testable prediction that would help physicists distinguish it experimentally from other theories of the universe. And without this crucial element, the multiverse interpretation of quantum mechanics is little more than philosophy, according to Woit. What this new supersymmetric multiverse interpretation does have is a simplicity– it’s neat and elegant that the many worlds and the multiverse are equivalent. Ockham’s Razor is fulfilled and no doubt, many quantum physicists delight in what appears to be an exciting. plausible interpretation of ultimate if currently untestable, reality. In 2013, a UCLA team used a unique telescope to discover a previously unknown companion to the nearby galaxy NGC 4449 (image above), which is some 12.5 million light years from Earth. The newly discovered dwarf galaxy had escaped even the illuminating eyes of the Hubble Space Telescope. NGC 4449B is stretched into a gigantic “S” so large that if one end were placed at the center of the Milky Way, the other end would reach all the way to the sun’s position. In fact, NGC 4449B is the largest dwarf galaxy known in the “local group” that also includes the Milky Way and the Andromeda galaxy. UCLA research astronomer Michael Rich collaborated with Francis Longstaff, a professor of finance at the UCLA Anderson School of Management and an amateur astronomer, in acquiring and using a specialized telescope designed to take images of wide fields of the sky. Known as the Centurion 28 (the diameter of the mirror is 28 inches), the telescope, and the observatory the astronomers used, are located at the Polaris Observatory Association. With the C28 telescope, the astronomers discovered the companion dwarf galaxy, which has “evidently experienced a close encounter with the nucleus of NGC 4449,” Rich said. Dubbed NGC 4449B, the dwarf galaxy has been stretched into a comet-like shape by this gravitational encounter. NGC 4449B had remained undetected because it is more than 10 times fainter than the natural brightness of the night sky and some 1,000 times fainter than our own Milky Way galaxy. 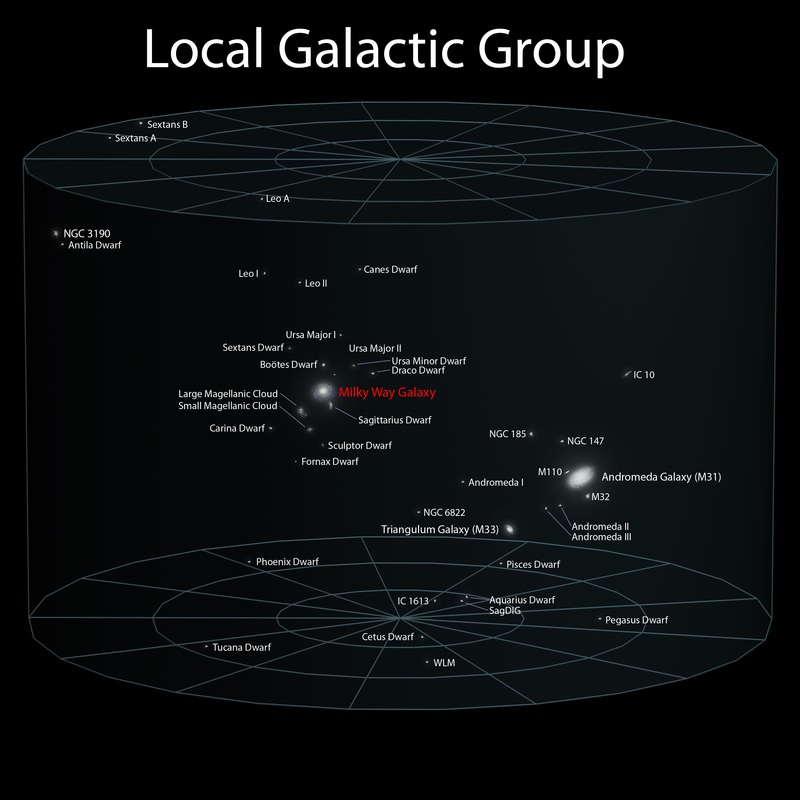 The dwarf galaxy is in a “transient stage,” Rich said, and will soon — by astronomical standards — be dissolved. The Milky Way has a similar companion, known as the Sagittarius Dwarf galaxy, which has been wrapped around our galaxy as it orbits and which loses its stars to the Milky Way’s gravitational tug. The deep images of the larger NGC 4449 revealed other surprises as well: a strange arc of stars that might be an ingested galaxy, and a “remarkable halo” of old stars that appears to consist of two parts; the outermost part of this “halo” population was unexpected, and makes NGC 4449 equivalent in size to the Milky Way. The origin of these old stars is not known, but they may have been acquired when galaxies similar to NGC 4449B fell into NGC 4449 and were shredded, Rich said. Original UCLA article is here. This past January, astronomers used the ESO’s HARPS planet hunter in Chile, along with other telescopes around the world, to discover three planets orbiting stars in Messier 67. Although more than one thousand planets outside the Solar System are now confirmed, only a handful have been found in star clusters. Remarkably one of these new exoplanets is orbiting a star that is a rare solar twin — a star that is almost identical to the Sun in all respects. The first of these planets proved to be orbiting a remarkable star — it is one of the most similar solar twins identified so far and is almost identical to the Sun (eso1337 – http://www.eso.org/public/news/eso1337/) . It is the first solar twin in a cluster that has been found to have a planet. Solar twins, solar analogues and solar-type stars are categories of stars according to their similarity to the Sun. Solar twins are the most similar to the Sun, as they have very similar masses, temperatures, and chemical abundances. Solar twins are very rare, but the other classes, where the similarity is less precise, are much more common. Two of the three planets are “hot Jupiters” — planets comparable to Jupiter in size, but much closer to their parent stars and hence much hotter. All three are closer to their host stars than the habitable zone where liquid water could exist. “These new results show that planets in open star clusters are about as common as they are around isolated stars — but they are not easy to detect,” adds Luca Pasquini (ESO, Garching, Germany), co-author of the new paper. “The new results are in contrast to earlier work that failed to find cluster planets, but agrees with some other more recent observations. We are continuing to observe this cluster to find how stars with and without planets differ in mass and chemical makeup. But is our Sun actually an orphan, ejected billions of years ago from Messier 67? Recent computer simulations of the motions of stars in the cluster and have projected the path that our solar system would have had to take if it were ejected and concluded that it doesn’t seem highly probable. It would require a very rare alignment of no less than two or three massive stars in Messier 67 to provide the gravitational slingshot to throw our solar system out to where we are today, not to mention that the gravitational forces would likely have torn our infant solar system to shreds. The scientific community is still in hot debate over our galactic origins, but there is little doubt that, one way or the other, we have been orphaned from somewhere in the outer regions of the Milky Way. Last year, the very rare presence of a pulsar (named SGR J1745-2900) was also detected in the proximity of a supermassive black hole (Sgr A**, made up of millions of solar masses), but there is a combination that is still yet to be discovered: that of a pulsar orbiting a ‘normal’ black hole; that is, one with a similar mass to that of stars. The authors infer that less than 1% of the material initially within the black hole’s gravitational influence reaches the event horizon, or point of no return, because much of it is ejected. 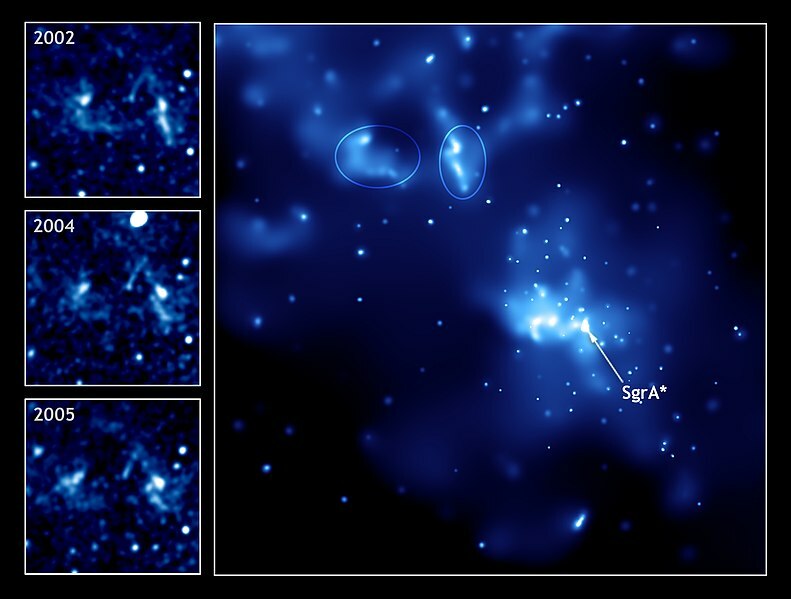 Consequently, the X-ray emission from material near Sgr A* is remarkably faint, like that of most of the giant black holes in galaxies in the nearby Universe. This work should impact efforts using radio telescopes to observe and understand the “shadow” cast by the event horizon of Sgr A* against the background of surrounding, glowing matter. It will also be useful for understanding the impact that orbiting stars and gas clouds might make with the matter flowing towards and away from the black hole. This image was taken with NASA’s Chandra X-Ray Observatory. The intermittent light emitted by pulsars, the most precise timekeepers in the universe, allows scientists to verify Einstein’s theory of relativity, especially when these objects are paired up with another neutron star or white dwarf that interferes with their gravity. However, this theory could be analysed much more effectively if a pulsar with a black hole were found, except in two particular cases, according to researchers from Spain and India. Until now scientists had considered the strange pulsar/black hole pairing to be an authentic ‘holy grail’ for examining gravity, but there exist at least two cases where other pairings can be more effective. 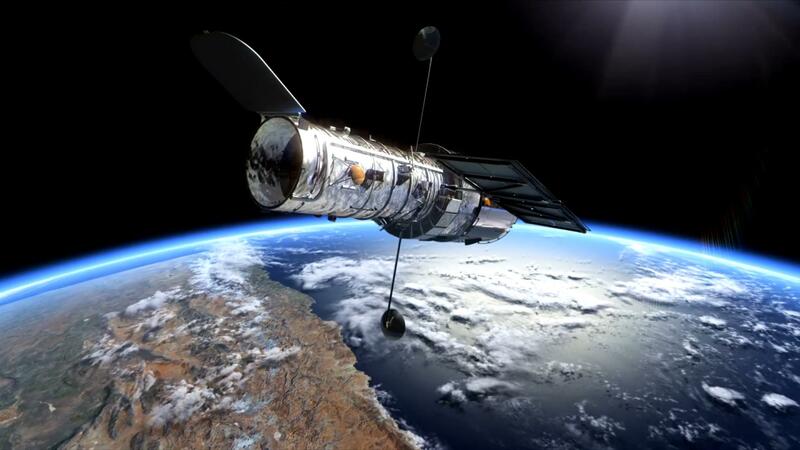 This is what is stated in the study that Torres and the physicist Manjari Bagchi, from the International Centre of Theoretical Sciences (India) and now postdoc at the IEEC-CSIC, have published in the Journal of Cosmology and Astroparticle Physics. The work also received an Honourable Mention in the 2014 Essays of Gravitation prize. In these two specific cases, the pulsar-black hole combination would not be the perfect ‘holy grail’, but in any case scientists are anxious to find this pair, because it could be used to analyse the majority of deviations. In fact, it is one of the desired objectives of X-ray and gamma ray space telescopes (such as Chandra, NuStar or Swift), as well as that of large radio telescopes that are currently being built, such as the enormous ‘Square Kilometre Array’ (SKA) in Australia and South Africa. The image at the top of the page shows dynamic rings, wisps and jets of matter and antimatter around the pulsar in the Crab Nebula as observed in X-ray light by Chandra Space Observatory in 2001. Manjari Bagchi y Diego F. Torres. “In what sense a neutron star−black hole binary is the holy grail for testing gravity?”. Journal of Cosmology and Astroparticle Physics, 2014. Doi:10.1088/1475-7516/2014/08/055. DNA can survive a flight through space and re-entry into Earth’s atmosphere — and still pass on genetic information. A team of scientists from the University of Zurich obtained these astonishing results during an experiment on the TEXUS-49 research rocket mission. Various scientists believe that DNA could certainly reach us from outer space as Earth is not insulated: in extraterrestrial material made of dust and meteorites, for instance, around 100 tons of which hits our planet every day. “This study provides experimental evidence that the DNA’s genetic information is essentially capable of surviving the extreme conditions of space and the re-entry into Earth’s dense atmosphere,” says study head Oliver Ullrich from the University of Zurich’s Institute of Anatomy. This extraordinary stability of DNA under space conditions also needs to be factored into the interpretion of results in the search for extraterrestrial life: “The results show that it is by no means unlikely that, despite all the safety precautions, space ships could also carry terrestrial DNA to their landing site. We need to have this under control in the search for extraterrestrial life,” points out Ullrich. Applied to the outer shell of the payload section of a rocket using pipettes, small, double-stranded DNA molecules flew into space from Earth and back again. After the launch, space flight, re-entry into Earth’s atmosphere and landing, the so-called plasmid DNA molecules were still found on all the application points on the rocket from the TEXUS-49 mission. And this was not the only surprise: For the most part, the DNA salvaged was even still able to transfer genetic information to bacterial and connective tissue cells. The experiment called DARE (DNA atmospheric re-entry experiment) resulted from a spontaneous idea: UZH scientists Dr. Cora Thiel and Ullrich were conducting experiments on the TEXUS-49 mission to study the role of gravity in the regulation of gene expression in human cells using remote-controlled hardware inside the rocket’s payload. During the mission preparations, they began to wonder whether the outer structure of the rocket might also be suitable for stability tests on so-called biosignatures. “Biosignatures are molecules that can prove the existence of past or present extraterrestrial life,” explains Dr. Thiel. And so the two UZH researchers launched a small second mission at the European rocket station Esrange in Kiruna, north of the Arctic Circle. The quickly conceived additional experiment was originally supposed to be a pretest to check the stability of biomarkers during spaceflight and re-entry into the atmosphere. Dr. Thiel did not expect the results it produced: “We were completely surprised to find so much intact and functionally active DNA.” The study reveals that genetic information from the DNA can essentially withstand the most extreme conditions..
Two types of biomolecules serve as the genetic information carriers for all Earthly biota. RNA on its own suffices for the business of life for simpler creatures, such as some viruses. Complex life, like humans, however, relies on DNA as its genetic carrier. Extremophiles have been discovered in recent decades thriving in strongly acidic hot springs, within liquid asphalt, and in other eyebrow-raising niches. Salt-tolerant bacteria and archaea, like H. volcanii, have been found to survive in deserts, and simulated Mars conditions. We should not be surprised, perhaps, if life has managed to take hold on formidable worlds. Recent research suggests that neutron stars may gradually transform into ‘strange’ stars – i.e. in stars made up primarily from the ‘strange’ quark. The conventional wisdom is that the electric field of a such a hypothetical strange star (made up from strange matter) at its surface would be so huge and its luminosity so big that it would be impossible to confuse it with anything else. However, Jaikumar and his fellow researchers from the Argonne National Laboratory, and two colleagues from Los Alamos National Laboratory in New Mexico, have challenged that. The team developed a theory about what a strange star would look like. One of the most interesting aspects of neutron stars is that they are not gaseous like usual stars, but they are so closely packed that they are liquid. Strange stars should also be liquid with a surface that is solid. However, Jaikumar and his colleagues challenge that. Strange stars are usually assumed to exhibit huge electric fields on their surface precisely because they are assumed to have a smooth surface. But according to the scientists neither neutron stars nor strange stars have such a smooth solid-like surface. One consequence is that a strange star wouldn’t have large electrical field at surface or be super-luminous. It also allows for a strange star to be less dense than originally thought, although such stars are definitely unusually dense compared to regular stars. Much of the matter in our Universe may be made of a type of dark matter called weakly interacting massive particles, also known as WIMPs, . Although some scientists predict that these hypothetical particles possess many of the necessary properties to account for dark matter, until recently scientists have not been able to make any definite predictions of their mass. In a new study, physicists have derived a limit on the WIMP mass by calculating how these dark matter particles can transform neutron stars into stars made of strange quark matter, or “strange” stars. WIMPs are thought to be largely located in the halos of galaxies. Although galaxy halos (image above) are not visible, they contain most of a galaxy’s mass in the form of the heavy WIMPs. Dr. M. Angeles Perez-Garcia from the University of Salamanca in Salamanca, Spain, along with Dr. Joseph Silk of the University of Oxford and Dr. Jirina R. Stone of the University of Oxford and the University of Tennessee showed that, when a neutron star gravitationally captures nearby WIMPs, the WIMPs may trigger the conversion of the neutron star into a strange star. One important issue is whether at high density ‘strange’ quark matter is more stable than regular matter (which is comprised of ‘up’ and ‘down’ quarks). Jaikumar and colleagues think that as a neutron star spins down and its core density increases, it may convert into the more stable state of strange quark matter, forming a strange star. Theorists cannot say with absolute certainty whether or not a neutron star gradually converts into a strange star. The conversion occurs, according to new research, as a result of the WIMPs seeding the neutron stars with long-lived lumps of strange quark matter, or strangelets. WIMPs captured in the neutron star’s core self-annihilate, releasing energy in the process. It’s the astronomers’ job to discover whether strange stars exist or not. Either discovery will have important implications for the theory of Quantum Chromodynamics (QCD) — which is the fundamental theory of quarks. “Finding a strange star would improve our understanding of QCD, the fundamental theory of the nuclear force. And it would also be the first solid evidence of stable quark matter”, Jaikumar said. Elsewhere, Kwong-Sang Cheng of the University of Hong Kong, China, and colleagues have presented evidence that a quark star formed in a bright supernova called SN 1987A (above), which is among the nearest supernovae to have been observed. Observing a quark star could shed light on what happened just after the Big Bang, because at this time, the Universe was filled with a dense sea of quark matter superheated to a trillion °C. While some groups have claimed to have found candidate quark stars, no discovery has yet been confirmed. Now Kwong-Sang Cheng of the University of Hong Kong, China, and colleagues have presented evidence that a quark star formed in a bright supernova called SN 1987A (pictured), which is among the nearest supernovae to have been observed. The birth of a neutron star is known to be accompanied by a single burst of neutrinos. But when the team examined data from two neutrino detectors – Kamiokande II in Japan and Irvine-Michigan-Brookhaven in the US – they found that SN 1987A gave off two separate bursts. “There is a significant time delay between [the bursts recorded by] these two detectors,” says Cheng. They believe the first burst was released when a neutron star formed, while the second was triggered seconds later by its collapse into a quark star. The results appeared in The Astrophysical Journal (http://www.arxiv.org/abs/0902.0653v1). High-resolution X-ray observatories, due to fly in space in the next decade, may have the final say. Neutron stars and quark stars should look very different at X-ray wavelengths, says Cheng. The image of SN 1987A at top of the page combines data from NASA’s orbiting Chandra X-ray Observatory and the 8-meter Gemini South infrared telescope in Chile, which is funded primarily by the National Science Foundation. 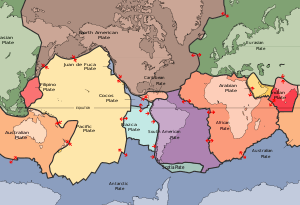 While the extinction of the dinosaurs has largely been explained by the impact of a large meteorite, the crash of the stromatolites remains unsolved. “It’s one of the major questions in Earth history,” says Woods Hole Oceanographic Institution microbial ecologist Virginia Edgcomb. The Antarctic discovery in an ancient lake in April of 2011 helped scientists better understand the conditions under which the Earth’s primitive life-forms thrived. “It’s like going back to early Earth,” said Dawn Sumner, a geobiologist at the University of California, Davis, describing her explorations of the eerie depths of East Antarctica’s Lake Untersee where Sumner and her colleagues, led by Dale Andersen of the SETI Institute in Mountain View, Calif., discovered otherworldly mounds of Photosynthetic microbial stromatolites. “The weather looks to be pretty good tomorrow, with clear skies and low winds, at least for Novo. Monday and Tuesday the weather may go down with 45 kt winds so we need to get the camp up as soon as possible….at least a few tents anyway. It will be great to get back to the lake, and everyone is pretty excited now.” Reports Dale Andersen of the SETI Institute in Mountain View, Calif in his Field Report from Lake Untersee, Antarctica 15 November 2014. The stromatolites, built layer by layer by bacteria on the lake bottom, resemble similar structures that first appeared billions of years ago and remain in fossil form as one of the oldest widespread records of ancient life dating from 3 billion years ago or more, to understand how life got a foothold on Earth. Lake Untersee is located at 71°20’S, 13°45’E in the Otto-von-Gruber-Gebirge (Gruber Mountains) of central Dronning Maud Land.The lake is 563 meters above sea level, with an area of 11.4 square kilometers and is the largest surface lake in East Antarctica. The purple-bluish mounds are composed of long, stringy cyanobacteria, ancient photosynthetic organisms. Similar to coral reef organisms, the bacteria takes decades to build each layer in Untersee’s icy waters, Sumner said, so the mounds may have taken thousands of years to accumulate. Today, stromatolites are found in only a few spots in the ocean, including off the western coast of Australia and in the Bahamas. They they have also been found thriving in freshwater environments, such as super-salty lakes high in the Andes and in a few of Antarctica’s other freshwater lakes. But scientists were stunned by the size and shape of the purplish stromatolite mounds built by Phormidium bacteria in Untersee’s extremely alkaline waters and high concentrations of dissolved methane, are unique reaching up to half a meter high, dotting the lake floor. “It totally blew us away,” Andersen said. “We had never seen anything like that.” The stromatolite mounds were found adjacent to smaller, pinnacle-shaped lumps made of another bacterial group, Leptolyngbya. “Stromatolites were one of the earliest examples of the intimate connection between biology—living things—and geology—the structure of the Earth itself,” said Woods Hole Oceanographic Institution (WHOI) geobiologist Joan Bernhard. Just as puzzling is the sudden appearance in the fossil record of different formations called thrombolites (“clotted stones”). Like stromatolites, thrombolites are produced through the action of microbes on sediment and minerals. Unlike stromatolites, they are clumpy, rather than finely layered. It’s not known whether stromatolites became thrombolites, or whether thrombolites arose independently of the decline in strombolites. Hypotheses proposed to explain both include changes in ocean chemistry and the appearance of multicellular life forms that might have preyed on the microbes responsible for their structure. Bernhard and Edgcomb thought foraminifera might have played a role. Foraminifera (or “forams,” for short) are protists, the kingdom that includes amoeba, ciliates, and other groups formerly referred to as “protozoa.” They are abundant in modern-day oceanic sediments, where they use numerous slender projections called pseudopods to engulf prey, to move, and to continually explore their immediate environment. Despite their known ability to disturb modern sediments, their possible role in the loss of stromatolites and appearance of thrombolites had never been considered. The Woods Hole researchers examined modern stromatolites and thrombolites from Highborne Cay in the Bahamas for the presence of foraminifera. Using microscopic and rRNA sequencing techniques, they found forams in both kinds of structures. Thrombolites were home to a greater diversity of foraminifera and were especially rich in forams that secrete an organic sheath around themselves. These “thecate” foraminifera were probably the first kinds of forams to evolve, not long (in geologic terms) before stromatolites began to decline. “No one will ever be able to re-create the Proterozoic exactly, because life has evolved since then, but you do the best you can,” Edgcomb said. They started with chunks of modern-day stromatolites collected at Highborne Cay, and seeded them with foraminifera found in modern-day thrombolites. Then they waited to see what effect, if any, the added forams had on the stromatolites. After about six months, the finely layered arrangement characteristic of stromatolites had changed to a jumbled arrangement more like that of thrombolites. Even their fine structure, as revealed by CAT scans, resembled that of thrombolites collected from the wild. “The forams obliterated the microfabric,” said Bernhard. After about six months, the foraminifera were still present and alive—but the rock’s structure had not become more clotted like a thrombolite. It was still layered. The researchers concluded that active foraminifera can reshape the fabric of stromatolites and could have instigated the loss of those formations and the appearance of thrombolites. The findings, by scientists at Woods Hole Oceanographic Institution (WHOI); Massachusetts Institute of Technology; the University of Connecticut; Harvard Medical School; and Beth Israel Deaconess Medical Center, Boston, were published online in the Proceedings of the National Academy of Sciences. To find answers, the group created a monster in the basement of the UA’s high-performance computing facility. Harnessing the power of the UA’s new supercomputer — nicknamed El Gato — the researchers combined knowledge from mathematical equations and astronomical observations to generate visualizations of an object known by astronomers as Sagittarius A* (“Sagittarius A star”), a supermassive black hole comprising the mass of 4.3 million suns. 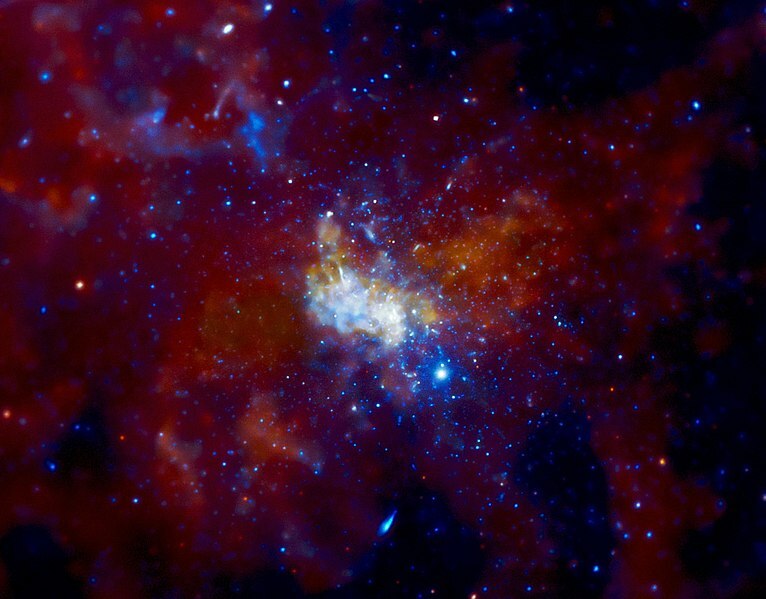 Located 26,000 light-years from Earth at the center of our galaxy, Sagittarius A* is tiny to the eyes of astronomers. Smaller than Mercury’s orbit around the sun, it appears about the same size as a grapefruit on the moon. The team just published the first major science results obtained using El Gato’s unique, massive, parallel-computing capabilities to create visualizations of what a space traveler might see upon approaching SgrA**. The results, published in two reports in the Astrophysical Journal — one focusing on the imaging and the other on the computing — provide some of the groundwork for the Event Horizon Telescope, or EHT, a huge undertaking involving scientists and observatories around the world to take the first-ever picture of SgrA*. The film Interstellar, starring Matthew McConaughey and Anne Hathaway, prominently features a black hole, touted as the first visual depictions based on the actual science and mathematics of [Albert]Einstein’s Theory of General Relativity. On some of the renderings, a special-effects team of about 30 experts reportedly spent up to 100 hours of running calculations to create each frame. As part of a collaboration that includes the papers’ first author, postdoctoral fellow Chi-kwan Chan, and researchers at Harvard University and MIT, the husband-and-wife research team of Psaltis and Ozel developed software algorithms capable of calculating the paths of millions of individual photons in mere seconds as they shoot toward the black hole. 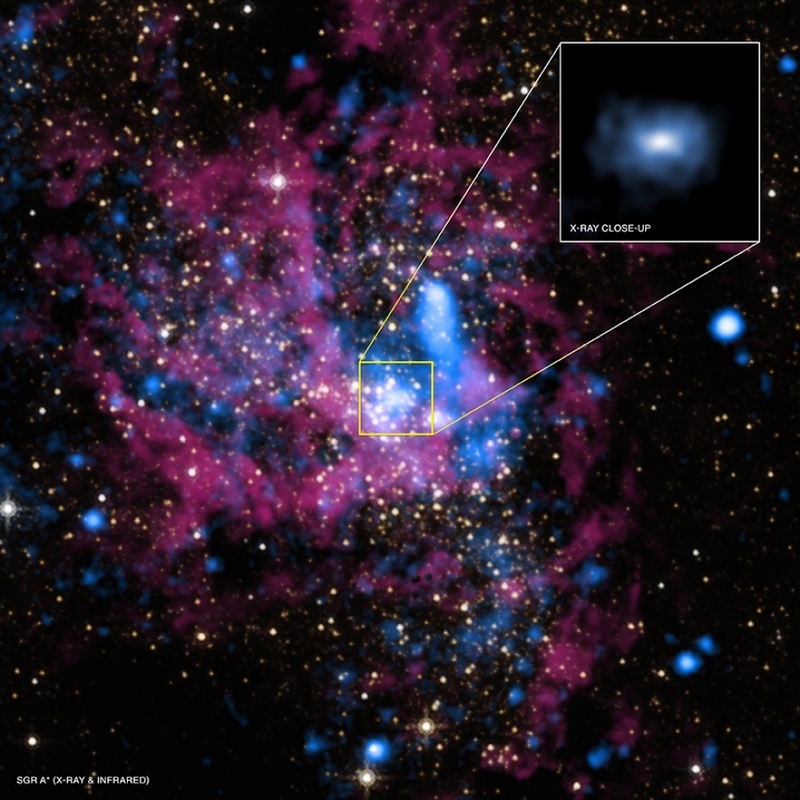 Funded by the National Science Foundation and NASA, the computer simulations are a crucial step before astronomers can start to look for the black hole using the EHT, functioning as a sort of field ID guide of what astronomers should look for once the EHT is up and running. The EHT will combine radio telescopes across the globe to create a virtual telescope the size of the Earth. These include the UA’s Arizona Radio Observatory as well as the South Pole Telescope, outfitted with new receivers built by a group led by UA assistant professor of astronomy Daniel Marrone. The gravitational field around a black hole is so immense that it swallows everything in its reach. Not even light can escape its grip. For that reason, black holes are just that: They emit no light whatsoever, and their “nothingness” blends into the black void of the universe. As matter comes under the black hole’s spell of extreme gravity, a cosmic traffic jam ensues, in which gas swirls around it like water circling a drain. As matter compresses, the resulting friction turns it into plasma heated to a billion degrees or more, causing it to “glow” — and radiate energy that astronomers can detect here on Earth. By imaging the glow of matter swirling around the black hole before it goes over the edge and plunges into the abyss of space and time, scientists can see only the outline of the black hole, also called its shadow. In addition to providing groundwork for the EHT, the simulations will support NICER, a new NASA mission involving an instrument that will be attached to the International Space Station, to help scientists better understand neutron stars and to test navigation methods for future spacecraft using neutron stars as extremely accurate clocks. Until EHT is ready to take the first images of what lurks at the center of our Milky Way, astrophysicists will have to get by with gaming on steroids — or going to the movies.